National mobilisation against the authorisation of permits for GM maize, October 2012-November 2014. From October 2011 to November 2014, the Permanent Peoples’ Tribunal (PPT) sat in Mexico. The PPT is an independent international legal body and the successor to the legendary Russell Tribunal – which enjoyed great visibility between 1966 and 1976 when it judged the crimes of the Vietnam War and the horrors of the Southern Cone dictatorships. In 2013, various communities and organisations – most of them close to the Red en Defensa del Maíz (Maize Defence Network) and the Asamblea Nacional de Afectados Ambientales (National Assembly of Environmentally Affected Parties) – held workshops in diverse regions and localities to systematically document the grievances arising from: the State’s abandonment of agriculture without concern for the problems of peasants and farmers in rural areas; policies undermining the indigenous peoples and peasant life; the destruction of tenancy systems and of the territories maintained by communities, subsistence and decent living conditions in communities; the voracity of the agroindustrial food system; and of course the irresponsible policy of promoting GM maize and the massive imports of maize of dubious quality for industrial uses. 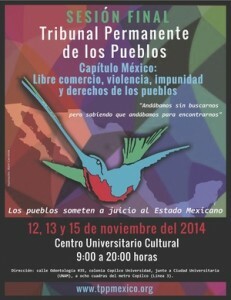 Poster for the final hearing of the Mexico Chapter of the Permanent Peoples’ Tribunal (TPP), November 2014, Mexico DF. All testimony provided ample evidence that the so-called structural reforms and international public policies promoted since the eighties are responsible, in conjunction with constitutional changes and reforms to laws and regulations, for the dismantling of legal and institutional protections at the expense of peasant communities. The subordination of Mexican agriculture to the interests of an industrialised global food system dominated by a few transnational corporations, the disempowering of the peasantry to the point where it isn’t profitable for them to produce their own food and the interruption or erosion of the living process of creating agricultural and cultural-social biodiversity are all direct effects of these policies and free trade agreements (which function as padlocks to make them irreversible). The corporations of the global food system are unforgiving to farmers, whether subsistence or commercial farmers, who seek to make a living from agriculture, even under the rules imposed by the dominant model. They are marginalised “as profit rates fall and the corporations act to cut the throats of any who should impinge on their financial stability.”4Consumers in both cities and rural areas are affected as they may no longer choose their own food having become the prisoners of public policies and the designs of corporations. It is a situation of structural violence, a process of dismantling rural environments, social property, peasant life and the possibility of people feeding themselves. Everything to ensure that transnational companies obtain legal certainty and the opportunity to accumulate vast tracts of land or establish oligopolies in key market sectors, such as seeds or grain purchasing and distribution, grain processing and retail sales. The result: a vast forced rural exodus and the inexorable growth of cities with, in turn, repercussions in the form of further aggravation of the problems in the countryside. National mobilisation against the authorisation of transgenic maize permits, October 2012-November 2014. Mexico’s insertion in neoliberal globalisation has been associated with an extraordinary increase in suffering for the Mexican people. Neoliberal globalisation generates strong imbalances between the market and human rights. As the economy globalises, the democratic institutions safeguarding the majority’s rights are subordinated and marginalised; globalised institutions substitute for democratic control via the opaque regulation of international trade. Neoliberal law provides a framework for wealth accumulation and the concentration of economic and political power required to meet the challenge of eliminating the “losers.” Moreover, neoliberal law is based on the architecture of impunity constructed in favour of multinational companies and capital. Inequality and asymmetry are integral to this process. Workshop in the Guerrero Mountains, part of the deliberations on the systematisation of violence against maize, food sovereignty and people’s autonomy, April 2013. There is an open war, of a criminal character, against the autonomous subsistence of broad groups, including, notably, the indigenous peoples and peasant communities. In dispossessing them of their independent means of subsistence, one condemns them to migration, dependence on assistance programs, misery, marginalisation and death… The imposition of an intensive agroindustrial model –which includes transgenics as one of its most extreme elements – by the Mexican State and corporations such as Monsanto, Syngenta, Dow, BASF or Cargill, not only constitutes an attack against a culture, but also a veritable war against subsistence, spearheaded via the confection of laws to prevent the defence of peasant agriculture and independent [food] production. Pre-hearing on the question of attacks on community life in Acatepec, Hidalgo, part of the deliberations on systematisation of violence against maize, food sovereignty and peoples’ autonomy, November 2013. According to the PPT, public policies and laws produce the following results: they favour corporations even if they erode the general profitability of farming activity and undermine people’s food security; they encourage the oligopolistic control of land and water; they impose laboratory seeds (hybrids and transgenics) and highly toxic inputs; they criminalise native peasant seeds and their associated fabric of relationships; and they drive vast systems of intellectual property. Corporations are taking control of the entire food chain (from the land to retail food sales). Furthermore, emptied lands are being invaded with mining, development, tourism and pseudo-conservation projects, garbage dumps, etc. This way leads only to widespread environmental devastation. The general indictment sought a comprehensive perspective as a method for interconnecting the different elements of the process. The rulings echoed this comprehensive perspective, which not only sought to elucidate specific cases but also to disentangle the system’s dynamics and structure. 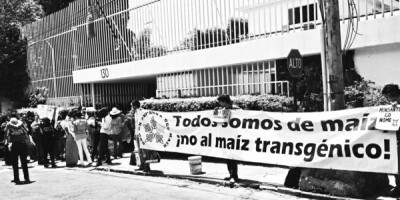 After several attempts dating back to October 2012, on 5 July 2013, a group of civil society organisations, scientists and lawyers filed a class action suit against the sowing of GM maize in Mexico. This suit resulted in “a precautionary measure authorised on 17 September 2013 which required the suspension of GM maize permits for the duration of the trial”. Thanks to this measure, all permits for the sowing of GM maize throughout the country were suspended by a court order. The injured parties allege that the Mexican State is guilty of deviation of powers as several government agencies and five companies “have brought 73 challenges against the suit and precautionary measure, as of 17 September 2014, including appeals and applications for review, revocation, the judge’s recusal, as well as amparo actions.”23 Governmental agencies have no hesitation in supporting corporations in instituting an instrument of control that automatically privatises not only a particular variety but also entire species and, in the long term, agricultural activity as a whole. The legal actions of the government and the corporations, and the deviation of power implied, are intended to stop civil society mobilisation as well as the suspension of GM maize sowing. 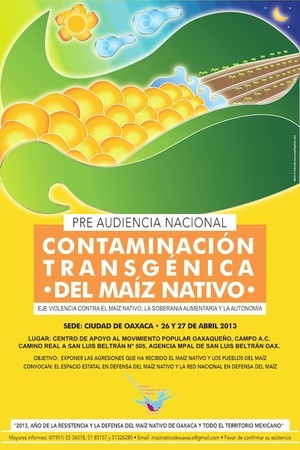 Poster for the prehearing on contamination of transgenic maize in San Luis Beltrán, Oaxaca, April 2013. 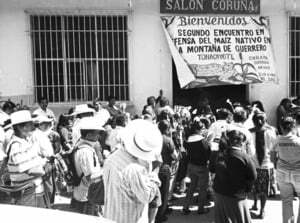 The Permanent Peoples’ Tribunal process opened multiple spaces and networks where the assembled participants reflected on and analysed what was happening to them. This process was about collectively understanding how to transform the conditions burdening them. Communities are reassessing the role of local agriculture, their own independent production, and “ancestral crops and native seeds.” They endeavour to keep their young people in their communities and regions to ensure that the critical mass of people who act and think as a community are not wasted, lost or broken. They know that they must, whatever the cost, open and strengthen spaces for assembly, community and reflection (as a focal point for the collective creation of knowledge and general understanding of the world and the tasks ahead). And they know that local and regional ties must grow and strengthen. 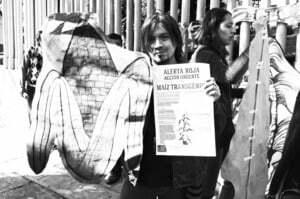 1 Petitoria formal al Tribunal Permanente de los Pueblos, Fundación Lelio Basso, Rome, Italy, encaminada a instaurar un Capítulo México donde podamos ventilar los nexos entre Libre comercio, guerra sucia y derechos de los pueblos, Comité promotor del Capítulo México, February 2011. See also the Universal Declaration of the Rights of Peoples, adopted in Algiers, 4 July 1976. 7 Jean Robert, “Por un sentido común controversial”, in GRAIN (compilation), No toquen nuestro maíz, June 2014. See Iván Illich, El trabajo fantasma. Complete Works, Tome 2, FCE, Mexico, 2008. 8 See note 6: Dictamen presentado en la Preaudiencia: Colisión Campo-Ciudad, Tepoztlán, Morelos, op. cit. 9 See Tenencia de la tierra y derechos agrarios (pdf), December 2003. http://www.sagarpa.gob.mx/sdr/evets/sm_jovenes/pdfs/1_eirr_sra.pdf. 10 Centro de Estudios para el Cambio en el Campo Mexicano and GRAIN: Reformas energéticas, despojo y defensa de la propiedad social de la tierra en México, biodiversidadla.org, 2014. 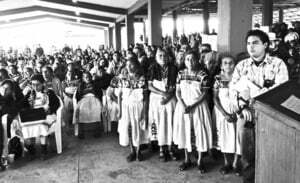 11 “El Estado mexicano no reconoce los derechos de los pueblos indios”, Ojarasca 178, February 2011. 14 Permanent Peoples’ Tribunal, Dictamen sobre Violencia contra el Maíz, la Soberanía Alimentaria y la Autonomía de los Pueblos, third thematic hearing as part of the Free Trade, Violence and Peoples’ Rights in Mexico process (2011-2014), Mexico, 19-21 November 2013. See www.tppmexico.org. 17 Dictamen sobre Violencia contra el Maíz, la Soberanía Alimentaria y la Autonomía de los Pueblos, op. cit. 21 Pat Mooney (ETC Group), “La FAO contaminada transgénicamente”, in GRAIN, Coa, Casifop, El maíz no es una cosa, es un centro de origen, México, 2012. 22 See note 6: ruling on Contaminación transgénica del maíz nativo, San Luis Beltrán, Oaxaca, op. cit. 24 Andrés Barreda, “La catástrofe del agua en México sólo la explican las políticas del TLC,” Ojarasca 178, February 2012. 27 The great food robbery, op. cit. 28 See note 6, Dictamen de la Preaudiencia: Colisión Campo-Ciudad, op. cit. 29 See note 6, Dictamen de la preaudiencia de Políticas de exterminio contra el Pueblo Maya, Táan U Xu’Ulsaj K-Kuxtal, Maní, Yucatán, op. cit. 30 PPT, Dictamen sobre Violencia contra el Maíz, la Soberanía Alimentaria y la Autonomía de los Pueblos, op. cit.